David Powers King: Special Post: Awards, Meme, Shout-Outs! Special Post: Awards, Meme, Shout-Outs! Sorry, friends, but today's advisory post is on hold for some serious reciprocity that needs to go down (and it's better to give a weekend spotlight than just one day). Again, I can't thank you guys enough for giving WOVEN such an awesome welcome. More reader feedback is pouring in (one of them read it in six hours--thanks, Cami! ), with excellent suggestions that will make this story stronger (the best part--there will be no serious rewriting! Just magic system clarification and a better reason for an event that happens at the end). Sweet! Recently, a couple new members and one who has followed me since . . . well, a long time . . . were gracious enough to bestow some awards! Thanks, you guys! Be sure to visit their blogs, like now! But first, I'm going to respond to Michael's Meme. Are you a rutabaga? - If you're going to call me any kind of edible vegetation, make it a kumquat. Who is your current crush? - Only the best wife in the whole planetsphere! Upload a heartwarming picture that makes you smile. When was the last time you ate a vine-ripened tomato? - At my In-Laws, though I can't remember when. 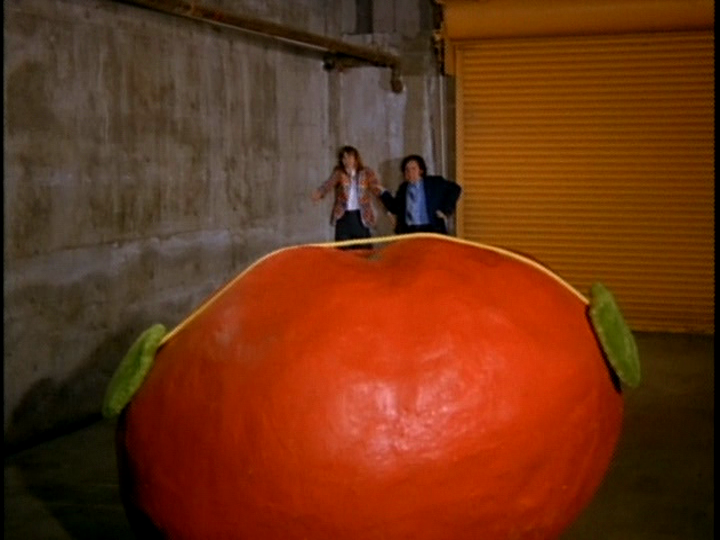 They have a killer garden with killer tomatoes! Name one habit that causes other people to plot your demise? - Not sure if I have one of those. I have habits that make people sigh and roll their eyes, though. What is the weirdest, most-disgusting job you've ever had to do? - Cleaned a bathroom after someone finger-painted all the walls with their . . . yeah, that's enough. Where da muffin top at? - I don't know, but I want one! What author introduced you to your genre? - Orson Scott Card for Sci-fi and Gail Carson Levine for Fantasy. They doomed me for life! Describe yourself using obscure Latin words. . . . I'm so bad with Latin. E pluribus unum, or something . . .
1. Thank the giver and link back to their blog. 2. Reveal your top 5 picks and let them know. 4. Have faith that your followers will spread the love. 5. And most of all - have bloggity-blog fun! 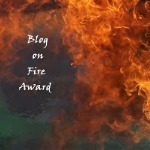 The Blog on Fire Award? I don't know the rules for that one, but I'm sort of a rule breaker with awards. That's why I'm passing these on to ALL of the new members that I'm going to give a Shout-Out to, right now! Congrats! Accept these awards/meme if you wish. If you haven't already done so, go visit these bloggers! You guys are great, as are your blogs! Keep up the good community vibe and pass those awards/memes along (if you already have these awards, or answered this meme, or already have over 200 followers, then your awesomeness was recognized long before we met)! New update Monday. Thanks for clicking by! I'm David, and I'm constructing a writer's nook. Congrats, but dang. I had an award for you but someone beat me to it. Ha ha! I'm a spidey geek myself. When I was a teenager and the Tobey McGuire version came out, I saw it in the theater something like 12 times. Yeah, I'm a nerd. You're the man with the awards! I'm digging it. And I totally love the spidey picture along with all the fun questions and answers! So great. And good to hear you are getting some awesome feedback on your book! It's going to be fabulous! I almost spit Sprite out of my nose when I read the "E pluribus unum, or something..." That was hilarious. Oh, and fingerpainting with... yuck. I like your take about the Blog on Fire Award. Thank you David, for the mention. I just did a post yesterday about the Liebster award. I've found plenty of new blogs (including yours) through that recently. I'm looking forward to the Spidey remake, even if it seems to be on the heels of the last one. Thanks so much for the shout-out! I've been just awful at keeping up with blogging lately but it's great to know someone's reading :) I'm looking forward to reading your blog, too! Thanks David. You're awesome. Laughed when I saw the spidey pic, it made me think of how my husband would probably put a picture of a guitar or something and call it heartwarming. Uh, poop on walls-let's just say my four year old used to be put to bed with duct tape around his diaper. another time, though. Thanks for the shout out. Your awesomeness knows no bounds! Very fun post, made me laugh. Congrats on the award! And holy huge tomato, batman! Wow. Lot's going on... the very definition of e-community. one of these days I'm going to have to learn what meme means. Love the images... especially the killer tomato. Makes me want to watch that movie... and eat a vine-ripened tomato.